If the first issue of the German English German Frieze (d/e) was concerned with the prevalence of English in the global art world this was not intended as a paternalistic gesture, but rather something that came out of a genuine altruistic concern. And what better to illustrate the thesis than the Croatian artist Mladen Stilinovic´s banner, An Artist Who Cannot Speak English Is No Artist? However, the work could also be seen as ironic. By saying that an artist who cannot speak English is no artist, the artist could for instance be commenting on some more complex presuppositions of contemporary art and it´s communication systems. 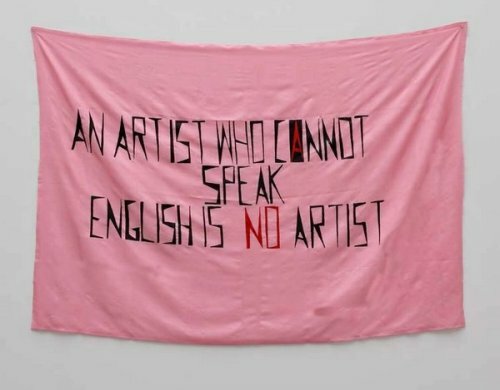 Not only does the banner claim that “an artist who cannot speak is no artist”, thereby pointing at the linguistic paradigm of contemporary discourse of discourse critique – a discursive tendency which tends to promote ’interesting’, discussion-based art work (or – God forbid – conversation pieces), it also claims that the artist should speak a certain language. The reason for this particular language has without doubt very little to do with it´s linguistic character – like, say ancient Greek did for Heidegger – but mirrors the political order after the second world war, Western cultural imperialism, CIA´s interest for contemporary art and what have you. As the sewn banner has an English text on it, we can also assume that the artist who made it is an artist: an English speaking, or English writing, artist. Needless to say this English literate artist is excluding the English illiterate in a gesture that can be interpreted as aggressive, exclusive and ironic. Therefore we can, according to the internal logic of the work, both take the sentence seriously and regard it´s presentation as an artwork. After all it´s written in English. Or we could go even further. As a banner, and to thereby as non-art, it is at once revealing (pointing something out) and concealing (excluding something). The banner it self serves as a statement of authenticity: of the artist´s realness. It has most certainly been made by a real artist, in difference to something like Keith Arnatt´s ‘Trouser – Word Piece’ from1989 (photographs of people holding picket-signs with the words “I am a real artist”), by shifting focus from the structural context of the artist to linguistic context of the artist´s work. Perhaps we haven´t regarded the work carefully enough – as it is the one who speaks, not writes in English who is an artist. Those artists´ who do not wish to speak at all, or do not wish to use English, even though they could speak the language, could be quite a nuisance here. Or all of the not-really artists who manage to use English anyway. The question is also which English this real international art world speaks? And if the prevalence of French, Chinese or Spanish speakers in biennales, art fares and exhibitions, mean that we´re seeing art by quasi-artists, or that the non-English context is false. It has been suggested that this linguistic monster, the “Esperanglo” of the second, third or fourth tongue, with a jargon that has curated words like “contemporiniety”, “hypotheticality”, “carnologophalocentristicity”, “prevailing Zietgeist” and a rhizomatic phonetic system is a language that has no masters. In 2011, the English English Freize branch, Freize Projects, nicked some ideas from the Dutch artist Nicoline Van Harskamp and launched the podcast ”Do you speak English?” claiming precisely that English has become the new Lingua Franca of the art world, spoken by people of many nationalities around the globe: ”Who´s English then are we speaking,” they ask, “and how does its ambiguous status affect what we say?” At the end of the day we might ask who Freize´s “we” is, and which global art world are we talking about? Isn’t it the case that the English spoken in the English global art world often transcends many monolingual English native speakers capacity for comprehension? Indeed, it could even be a disadvantage for the advantaged to speak it too well. Ya acabo – does the real artist have to learn to Verfremdungseffectivley speak English as if it were a langue estranger, or une launge mineure in order to become a part of the echt Kunst Welt? Perhaps linguistic fàngzhú is the only solution for the poor Anglo-native artist who only speaks inglés and a-priori can conclude; “An artist who cannot speak English is no artist”?